Gravedigger’s Local 16 is no stranger to spooky papercraft, so it only makes sense that we celebrate Chinese New Year with a papercraft Chinese hopping vampire! 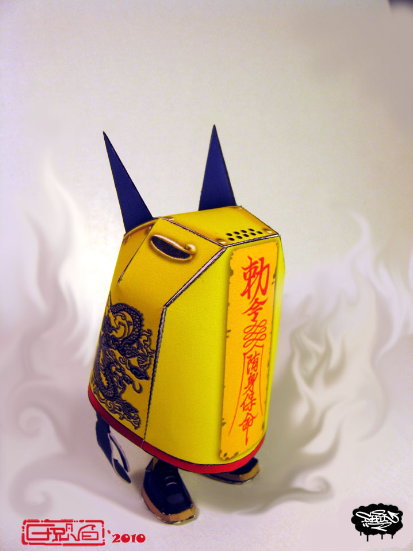 The one pictured above was designed by GRAVE (which was made using Shin Tanaka’s limited edition “Gritty” template). If you want to build your own papercraft jiangshi (which translates as “stiff corpse”), all you have to do is contact GRAVE and he’ll send you the necessary templates. Being made from a preexisting template, GRAVE’s take on a Chinese hopping vampire doesn’t look like your typical jiangshi. When you consider how the “Gritty” template looks after the covering is removed, some might be disappointed in the end result. I’m not, as I understand this is the artist’s way of paying tribute to movies featuring the monster, rather than an attempt to recreate one in paper form. Besides, GRAVE and Shin Tanaka go together like peanut butter and chocolate, as further evidenced by this amazing “brass knuckle bot.” Let’s not look a gift horse in the mouth. But this template can still be of use to purists. If you leave the removable covering on, you can pretend it’s a jiangshi encased in some sort of metal casing. Perhaps it’s meant as a way to contain it so that it can’t hurt anyone (with the spikes on the back being there to get it pinned to the ceiling should the talisman restraining it come loose and it tries to hop away) or perhaps it’s merely protective armor added by someone seeking to use it as a weapon. Being blind, a Chinese hopping vampire would have no need for eye holes, so we can imagine that the holes are there to help it search out its prey via its sense of smell and/or hearing. Hell, who’s to to say the process that turns a corpse into a jiangshi won’t eventually result in it changing into a more inhuman form if enough time goes by? Special thanks to GRAVE for use of the image!